FAT BOY FISHING LURES, custom and hand perfected fishing lures. 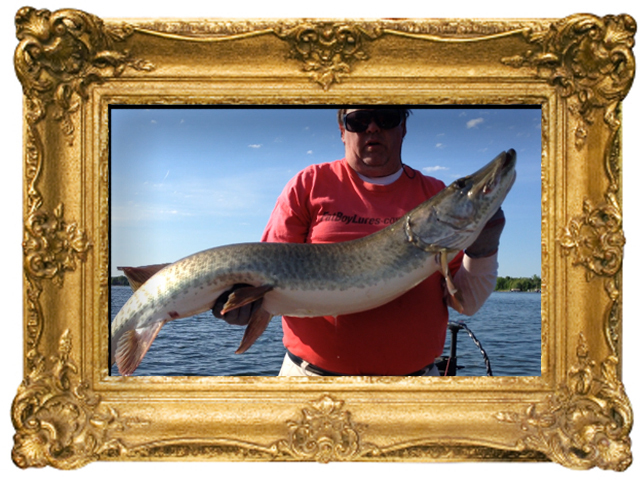 Fat Boy Picture Perfect Lures are hand-crafted Muskie and Northern Pike Lures created by Mark Murphy of Fargo, ND. From the first time he saw that his own personal hand-crafted lures were catching trophy fish, he knew he had created something very special. 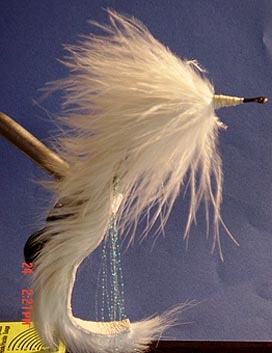 Mark's started out very early in life hand-tying rainbow trout flies. Marks' father, Lawrence Senior, taught his young son the basics of tying flies for rainbow trout and bluegill. As Mark grew up, he and his family fished Missouri farm ponds for bluegill and bass. The family would vacation at Bennett Springs State Park near Lebanon, Missouri for rainbow trout. He started getting some positive responses about the look and durability of the rainbow trout flies he had been tying. As the years went by, Mark continued to tie and began crafting larger flies, but still something was missing. As time went by fishing returned to Mark as his own family grew. Mark started tying flies again, but this time something was different. Mark fell in love with.........."TOOTHY CRITTERS". Mark had found a new calling. PIKE FLIES big, bold, tough and ready to fight. Mark began tying pike flies for friends and family and given them away as gifts. These pike flies were starting to get around from fisherman to fisherman on the lakes of northern Minnesota. Soon to follow, fellow fishermen were asking about his flies and where he sold them. So Mark rose to the occasion and started taking orders to fulfill those fishermen's requests. With all the interest in pike flies, Mark still saw a void. There were lots of muskie and pike lures available. But none of the lures really looked like the FISH!! Mark saw fish swimming in the water, but the lures didn't look like fish. Most lures looked like cartoon characters to him. 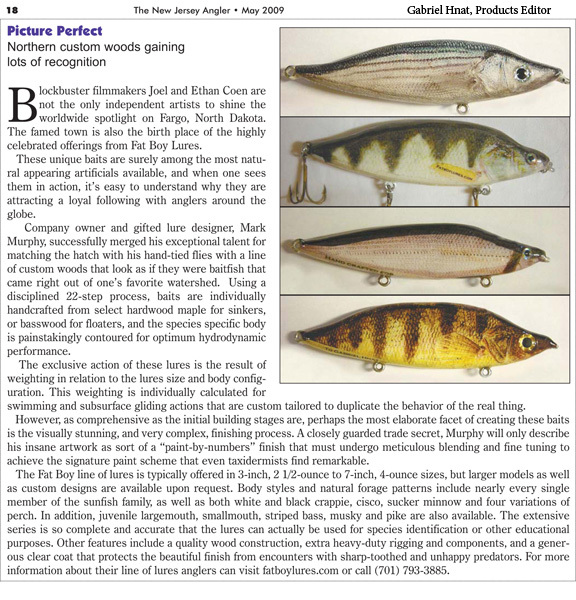 So Mark set out to create Muskie and Pike Lures that looked like.........REAL FISH. After 2 years of trial and error. Between success and frustration, FatBoy Picture Perfect Lures were born. The fish in lake, now look like the lure on your line. 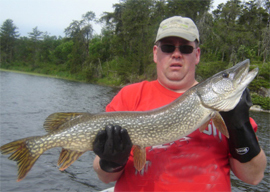 Mark loves to fish on the lakes of Minnesota, Missouri, and Canada for big game fish. He created his first Bluegill lure two years ago. Mark had great success catching Muskie and Northern Pike. When fellow muskie hunters saw the craftsmanship of his FatBoys, they bought up everything he had in his tackle box. All of Mark's lures are made by his own hands right here in Fargo, North Dakota USA. He makes each lure one at a time and never hurries them. Every Fat Boy Picture Perfect Lure is made from 100% USA Harwood Maple. All the componets of every Fat Boy Picture Perfect Lure are made in the USA. Mark uses only top quality components such as; Strong 2X - 3/0 treble hooks with 2x tough Stainless Steel Split Rings and the 1.06" MegaMagnum eyelets. All these components come together to make a superior crafted Muskie lure. Mark doesn't copy existing store-bought lures just to make a quick buck. He's always researching and listening to fishermen on what is catching and what's not. A design can be replicated but never exact because they are done by hand and not machine replicated. Mark's FatBoy Lures have become popular among Minnesota and Canada fishermen and the name is taking notice. Many have had great success with his lures. Many love the lures because each lure is like a piece of art, that actually look like a live fish. FatBoy Lures can be made to your specifications. Whether your FatBoy lure looks like a Perch, a Bluegill, the American Flag, or even a photo of yourself, Mark can make your lure the way you want it done. Every lure is its own piece of art and no unreasonable request is turned away without reason. Read the article. Click Here. "Beautiful piece of art. As a taxidermist I am impressed. I want them all. Thanks!" "WOW! What a lure.. this has pike written all over it .. Canada here I come!" "Awesome lures....dang this looks EXACTLY like a bass....should be a killer lure!" "Workmanship was A+++ , good contact, nice fella!" "Very good, 100% satisfied, Great seller, plenty of communication. THANKS #1"
"Great lure, fantastic communication, and speedy shipping. A+"
"Fantastic lures, great person to deal with, fast fast delivery, highly recommend"
"Great lure and lightning fast shipping. Thanks! will buy again AAAA+++"
"Great! Well produced item. Seller honest, friendly, fast ship to Canada. The BEST!"